The Carolinas Balloon Association is very happy to announce that two of our youth have been awarded scholarships to the Great Eastern Balloon Camp, to be held this summer in Pennsylvania. Both young men are student pilots and have attended the camp in the past and are excited about the opportunity to attend again. Club member Tom Tomasetti serves as one of the instructors for the camp and recommended both young men. Harrison Kuehl has been awarded our club scholarship this year. John Daniels has been awarded the Jo Cline Memorial Scholarship, which was donated to the club by Carolina BalloonFest. Jo is missed in the ballooning community for her support and encouragement of area balloonists. We think it is quite fitting that young balloonists will continue to get training in her memory. Both young men have been involved in crewing for local pilots and are excited about the prospect of being student pilots, through this and their past camp experience. To qualify for the scholarship they needed a recommendation from a club member and had to submit an essay on why they wanted to attend. Congratulations to both winners, and to all club members who are supporting them along the way. One of our goals as a club is to continue ballooning to the next generation and the support of our community’s fantastic young people is a great way we can do this. Hi! My name is Harrison Kuehl and I’m a future hot air balloon pilot. I am so excited about going to the Greater Eastern Balloon Camp for the third year in a row! The camp is such a great experience for me and I not only learn a lot, but I get to see old friends and make new ones. I have been crewing with the Above and Beyond balloon team for many years. Our pilot Tom Tomesetti recently praised me for my observation skills. I noticed a tear in another teams balloon envelope that was being inflated next to us. I pointed this out to my crew chief and pilot who told the other balloon’s pilot. I was told that this may have helped prevent an accident from happening. Attending the GEBC has given me opportunities to see how the pilots make important flying decision like how to properly read the weather apps and decide if flying is a go or no go, keep up on safety and getting to go to a repair station and seeing how balloon repairs are done. As a member of the Carolina Balloon Association, I recently attended a seminar to give me more training on fire and first aid. Another important thing I’ve learned while being part of a crew is that while at rallies and even at balloon camp, you don’t get much sleep and you eat while on the run. You just don’t realize how busy you are until you are done and then just crash. It’s all worth it because its so much fun. My next goal is to get my junior pilot’s license. I think that by attending GEBC I will be more prepared to take the test. I can learn from other students who have already gotten the junior pilot’s license as well as the instructors. After I get my license I want to start saving my money to get my very own balloon. Hopefully my mom and dad with help me out with that. Thank you for the opportunity to let you know how much ballooning and the GEBC mean to me. I look forward to July and I hope that I can be a good student and future pilot! My name is John, and I had the privilege of attending the Great Eastern Balloon Camp in 2015, in Millersville, Pa. From the moment I arrived at camp, I know it would be a great experience. I was introduced to balloon enthusiasts from all over the East Coast, and even Canada! Some were experienced balloon crew people, and some had never been around ballooning, but wanted to learn about it. The program was very educational and the instructors were very interesting. Some of the subjects we studied were crew safety, weather, balloon maintenance, airspace, and even how to fly a balloon. Some of the highlights included to trips to a repair station and the local airport control tower. Some days, we were able to set up and inflate balloons and even tether them. The classroom portions of the camp were stimulating and interesting. I was able to identify some of my strengths and weaknesses. In the end, I was able to experience things that I’ve never encountered in ballooning. Thanks to our trip to the repair station, I made an effort to go to the Firefly factory to see balloon repairs made, and even assist with the annual inspection of the balloon I crew. 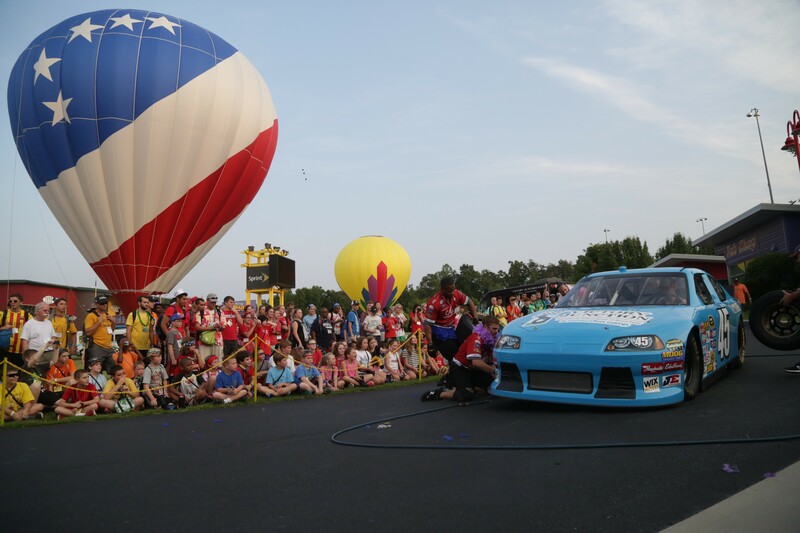 I was proud to represent the Carolinas Balloon Association, thanks to my scholarship last year. I learned a lot about ballooning and I want to attend camp again this year in Kutztown, Pa. I hope that the CBA will award a scholarship again this year so that I can continue to grow in ballooning and maybe even help other campers become more active in the sport. Finally, while attending camp, I was able to obtain my Student Pilot Certificate from the FAA and begin logging flight hours towards my Private Pilot’s license in ballooning. Thank you again for considering my request for a GEBC scholarship.